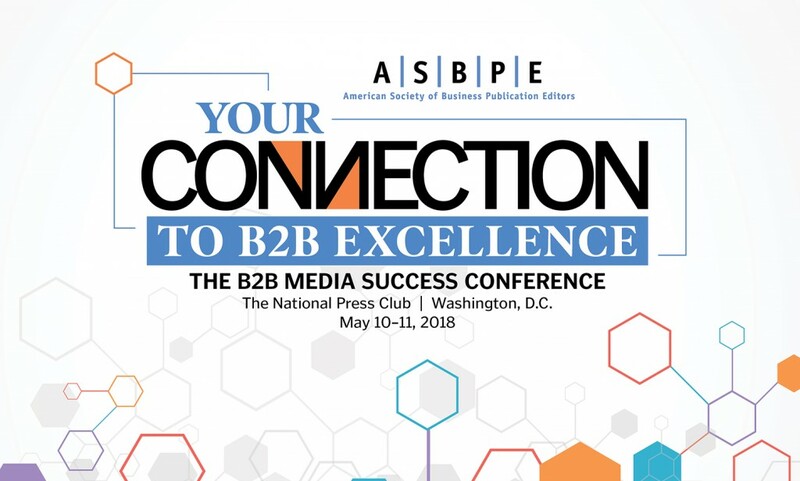 Welcome to the official page of the 2018 B2B Media Success Conference and Azbee Awards of Excellence Banquet – the annual gathering of the American Society of Business Publication Editors (ASBPE). We are particularly excited because the 2018 conference will be held for the first time at the National Press Club in Washington. Join us for stimulating panels, training and fellowship and to help us honor the national Azbee Awards of Excellence winners. Special “SEO 101” training workshop! There are readers around the world looking for content like yours — so let’s make it easy for them to find. Learn what search engine optimization is, how to identify terms to help you reach your audience, and how to write SEO-friendly headlines with finesse. Alysha’s 90-minute workshop will help you guide the B2B audience to your publication. Mimi Bell has served as editorial director for business magazines and custom publications and currently works with more than 60 freelancers every month. She’ll explain how to find meaningful freelance work and how publications can recruit and retain the best. In this interactive session, Ginger Conlon will discuss how B2B editors can apply content marketers’ best practices to engage and retain readers, build audiences, drive revenue and measure success. Topics include analytics, real-time social repartee, getting the most from each piece of content and thinking multi-platform. Conlon is the former chief editor of Direct Marketing News, 1to1 and CRM magazines. She is co-president of ASBPE’s New York City chapter. A vital and timely conversation with B2B publishing executives who will provide an outlook for the sector from their special vantage point and discuss what they need from their editors as the business model evolves. Attorneys with just the right specialties answer your questions about FOIA requests, copyright, internship labor law, and the all-important website accessibility rules under the Americans With Disabilities Act. B2B editors, especially at publications that are ad-supported, face two often-competing prime directives: first, maintain journalistic integrity; but also, don’t bite the hand that feeds you. Successfully resolving the questions and conflicts that arise is more than a question of business ethics—it’s a matter of business survival. Solomon’s presentation will be followed by a return this year of the Ethics Roundtable, with Solomon joining the panel along with ASBPE’s Ethics Committee members. Have you encountered an ethical issue at your publication? The Ethics Roundtable is the time to clear the air and listen to sound advice from the panelists and other conference attendees. Better yet, submit a description of the problem confidentially ahead of time! When does it make sense to offer your readers live video as part of your B2B multimedia mix? Robert Freedman and Sam Silverstein walk you through when you should go live and how you should go live based on two criteria: what you’re trying to accomplish and how much time and money you want to invest in your webcast. Learn even more at an Optional Tour of the National Association of Realtors’ multimedia studio after the session. Don’t miss another Optional Activity – a visit to the Newseum! Just show your ASBPE conference badge and you’ll get an instant 10% off admission to the Newseum. The Newseum is open until 5 p.m. on Friday, May 11, and from 9 a.m. to 5 p.m. on Saturday, May 12. One ticket is good for both days. ASBPE annual national awards dinner will be held on the evening of Thursday, May 10. Presentation of the 2018 Awards of Excellence, plus the Young Leaders Scholarship and the Stephen Barr Award winners. A reception precedes the dinner. The National Press Club ballroom. The National Press Club is a professional and social club for working journalists and communications professionals that has been a Washington institution for more than a century. Founded in 1908 as a haven for reporters in the nation’s capital to relax, enjoy a drink and play cards, the Club has flourished to become the World’s Leading Professional Organization for Journalists, and one of the most popular venues in the heart of downtown Washington, DC to host business, news and social events. For fun facts and historical milestones of the National Press Club, click here. Conference sponsorship opportunities for 2018 are still available! Packages start as low as $250 and can be customized for your needs. Please call Dom Yanchunas, ASBPE’s national president, at 646-673-7477 for more details. Washington is full of surprises during your May visit, with no fewer than four journalism-themed restaurants, a spy museum, the Capitol Steps and many more fun attractions for all ages. Click here to view a special list of ideas compiled just for ASBPE attendees.